TDDirectInvesting.co.uk is an international financial institution offering financial services including savings accounts, ISAs and online share dealing. As a well established name in the finance industry it is no surprise that TD Direct Investing's online share dealing service is quite well-priced, reliable and of reasonable quality. What is more, users are able to combine share dealing with other financial services such as ISAs and pension funds. This means you can effectively manage your own investments whilst taking advantage of the tax exemption offered with these services. Not only could you potentially earn yourself a tidy profit but trading online with TD Direct Investing is both cheaper and more convenient than more conventional forms of share dealing. Commissions are lower than those of telephone dealing and TD Direct Investing´s nominee service means that you don´t have to worry about certificates or paperwork. Furthermore, and uniquely in this category, TDDirectInvesting.co.uk provide a full share holders´rights service, allowing you access to company reports and voting rights. So if you think you can do better or at least as well as your banker then we would certainly recommend that you try out TD Direct Investing. First things first. Commissions are very reasonable. At between 8.95 and 12.50 per trade they may not be cheapest but they are certainly competitive. Furthermore, there are no account management fees unless you leave your account inactive for 3 months. These reasonably low charges make TD Direct Investing is great for small to medium traders, as your profits are less likely to be eaten up by incremental commissions and account management charges. Occasionally, commissions increase for the purchase of more obscure financial products but for most this should not be a problem. The sign up process is relatively easy and once you are in it becomes immediately clear that TD Direct Investing´s browser based share dealing platform is user friendly and simple yet facilitates access to a large amount of information and various financial products on 17 international markets. You can easily view and track your investments, access market information, individual company data and quarterly reports. The interface is also fully customisable, allowing users to set up their own short cuts and windows depending on their individual preferences. What is more, compared to most other products in this category, the website is pretty reliable with very few reports of lag, crashing or errors. This may be because TD Direct Investing publish prices with a 15 minute delay which traders accustomed to turbulent markets may find frustrating as prices may fluctuate significantly within 15 minutes leading to you missing an opportunity. However, level 2 share price information is available to accounts making over 75 trades per quarter, This is a high volume of trading and only worthwhile if you have invested a significant amount; the more you invest the more you risk, so users must think carefully before committing themselves to such a high level of trading in order to gain access to level 2 share price information. TD Direct Investing share dealing is also available on your iPhone so that you can manage your shares on the move. Obviously, this platform is slightly more limited and unreliable than the PC browser based version but it can be a life-saver if you should hear about a piece of news that could drastically affect your holdings. We also found TD Direct Investing´s customer service to be satisfactory, and the introductory tutorials and explanations well-thought-out and informative. It must be noted, however, that this is an executive only service, meaning that you will not be advised on your investments. This can leave beginners feeling pretty bewildered but on the other hand it is probably only worth investing in professional advice if you are looking to deal large amounts. Basically, you need to do your research before investing, by reading up on stock trading techniques and keeping up to date with market news from a variety of sources. As all stock dealers are legally obliged to state, investing in the stock markets is a risk and if you are not informed you are likely to lose out. TD Direct Investing do offer a trading balance which means you can start trading immediately without having to wait for funds to clear, or to make purchases for which you do not have the available funds. When making transactions you can select T3 - T20 meaning you have this many days to transfer the funds in order to make the purchase at that price. The longer the wait, the higher the commission, so we would recommend trying to trade with your own money whenever possible. 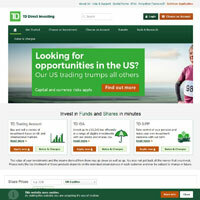 We only really encountered a couple of minor weaknesses with TDDirectInvesting.co.uk. Firstly, in the purchase of international share, users must convert their funds into the required currency. This can take some time and also increases your risk level by exposing you to currency fluctuations as well as share price fluctuations. Also, in your portfolio, only the middle prices of each of your holdings are available, making it difficult to make buying and selling decisions based on long term profits. These two faults, however, are minor and should not pose a problem for most users. Overall, we were quite impressed with what TDDirectInvesting.co.uk had to offer: low prices, a fairly user friendly interface, a wide range of financial products and plenty of information. Although larger investors may require even more information, professional advice and/or lower commissions, we would recommend TD Direct Investing to almost everyone with some knowledge of stock dealing. Their website is upfront, honest and informative, so for more information this would be your first port of call.